I believe that the balance of our environment is fragile and needs our help I also believe that Dr. David Suzuki knows how to help fix the planet; It's what he does best. I happen to be at my best making concrete ornaments. Do what you do best today, without hurting tomorrow. I am proud to be doing exactly that! 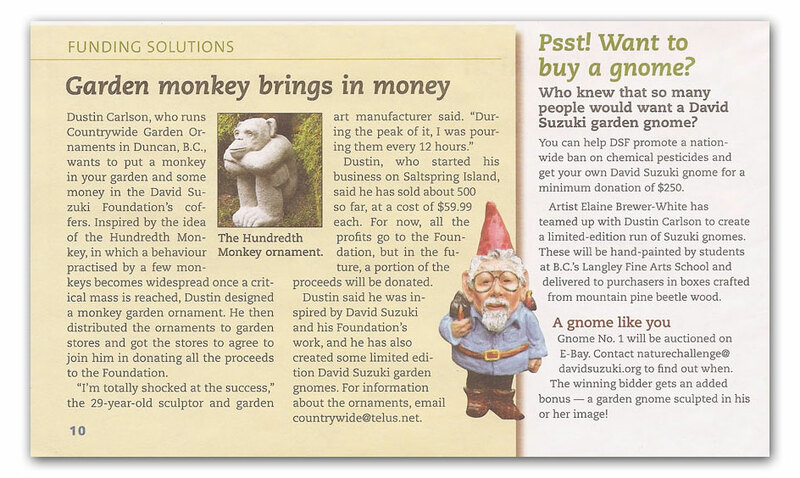 Shortly after I began work on the 100th Monkey campaign I was approached by the David Suzuki Foundation to help them on a marvelous project, "David Suzuki Digs My Garden"
Together with Elaine Brewer-White and the art students of B.C. 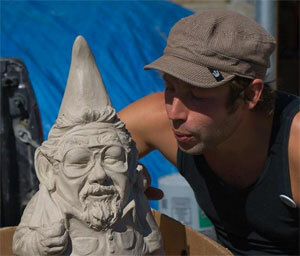 's Langley Fine Art school we have created clone Gnomes of Dr. David Suzuki! They will be available only through donation to the David Suzuki Foundation.